California First Lady Maria Shriver has put out the call to California's female undergraduate students to apply to become a California Women's Conference Scholar and receive up to $25,000 each to help pay for the final two years of their undergraduate college education. 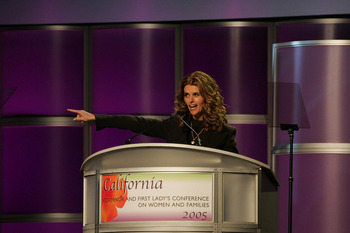 The scholarships, which are administered by Scholarship America, will be awarded to four finalists, selected by First Lady Maria Shriver, at the 2006 California Governor and First Lady's Conference on Women and Families in Long Beach on September 26, 2006. The California Women's Conference Scholars Program is open to all female California residents completing their second-year in a full-time undergraduate course of study at an accredited two- or four-year California college or university. Applicants must be pursuing a bachelor's degree in nursing, business, math or science, or special education (with plans to be a special education teacher); and must submit a one-page essay describing their community service involvement over the past two years. Please encourage your qualified AmeriCorps members to take advantage of this unique honor and opportunity. For additional information and to apply, please visit http://www.sms.scholarshipamerica.org/cwc/. Completed applications are due May 1, 2006. If you missed today's Team Day, you missed a really good, relaxing training complete with soft music, lit candles and dim lights! During this time of year it seems as if stress is at an all time high. Between AmeriCorps service, classes, finals, studying, work and every other activity under the sun, finding time to take care of ourselves is almost impossible! Our facilitator, Dawn Macy, Grants Coordinator for the CSUF Center for Internships & Service-Learning, used her 10 years of social work experience and professional training as a massage therapist to educate our members on the importance of first taking care of ourselves to prevent burnout. Burnout tends to happen when individuals are committed, passionate and dedicated to a cause. This describes many of our AmeriCorps members who often go above and beyond the call of duty, feeling exhausted in the process! Take this self quiz to see if YOU are experiencing burnout! Want to try and relax? Try this quick technique. Remember, practice makes perfect. The more you practice, the faster you will be able to "de-stress" yourself! Quick Relaxation: Get comfortable. Tighten the muscles in your toes. Hold for a count of 10. Relax and feel the sensation of release from tension. Flex the muscles in your feet. Hold for a count of 10. Relax. Move slowly up through your body- legs, abdomen, back, neck, face- contracting and relaxing muscles as you go. Breathe deeply and slowly. To learn more about managing your stress and to discover more tools and techniques visit "Stress Management from Mind Tools" online.